After Durban: All talked out? If a lexicon of international climate conferences is ever written, Durban will be listed right after the words debacle, delusion, disaster and disillusionment. Even the disappointments were not surprising at the 17th Conference of the Parties of the United Nations Framework Convention on Climate Change, which took place in South Africa last December. Instead, they followed the usual script: two weeks of ineffectual jargon-filled bickering followed by an agreement to delay action on climate change beyond the political lifespan of most of the governments present. This was dubbed the Durban Platform for Enhanced Action, although ‘there is no enhanced action plan in it’, as Nnimmo Bassey, chair of Friends of the Earth International, dryly points out. The reverse is true, with any new treaty only taking effect in 2020. The Platform charts a course to more than 4 degrees Celsius of global warming. The impacts will be unevenly distributed, affecting the world’s poorest people first, but the Durban agreement further shifts the burden of responsibility for addressing climate change from developed to developing countries. 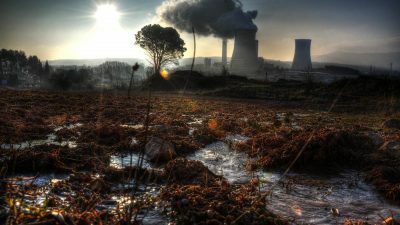 The Durban conference was billed as make or break time for the Kyoto Protocol, currently the only legally-binding international treaty on greenhouse gas emissions. Kyoto sets emissions targets for industrialised countries, while at the same time creating carbon markets to allow these countries to outsource action rather than making reductions domestically. But the current targets expire in 2012, leaving just the empty shell of an agreement. Durban reduced the Protocol to a zombie-like state. It kept Kyoto’s carbon trading mechanisms alive – a ‘remarkable and unexpectedly positive outcome’, according to lobbyists from the International Emissions Trading Association (IETA). But it did little to revive the ailing markets themselves, which crashed to their lowest ever levels at the start of the talks and look likely to remain thereabouts. The second key issue at Durban was the creation of a Green Climate Fund, which should in theory channel £65 billion per year from developed to developing countries to help cover the costs of addressing climate change. In practice, none of the money has yet been raised and little is likely to be forthcoming. Climate justice activists fear it could become little more than a ‘Greedy Corporate Fund’, directing loans and risk-guarantees towards multinational corporations and the financial sector to extend their reach in new markets. Opposition to this approach, which has been avidly supported by the UK government on the advice of City of London financiers, dulled its worst excesses, as well as restricting (for now) the role of the World Bank in shaping and running the fund. But there remains plenty of scope for the expansion of the fund’s ‘private sector window’ into a new source of corporate subsidies, with many key decisions rolled forward into 2012. At the heart of the climate conference problem lies a large and growing gulf between what is politically possible at such conferences and what is necessary. 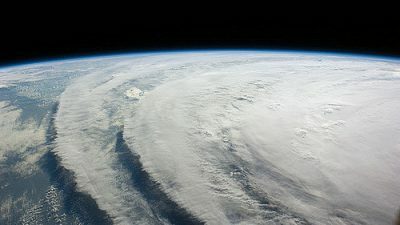 ‘The science of climate change and the politics of climate change, which claims to represent it, now inhabit parallel worlds,’ as an editorial in Nature put it, continuing that: ‘It takes a certain kind of optimism – or an outbreak of collective Stockholm syndrome – to see the Durban outcome as a significant breakthrough on global warming.’ Yet this is precisely how many commentators and NGOs, not to mention environment minister Chris Huhne, spun the story. A growing chorus of progressive voices, however, is asking deeper questions about the point of engaging in UN climate conferences. Ilana Solomon of ActionAid USA notes that while NGOs have become adept at ‘discussing the nuances of “should” versus “shall” of a protocol versus a legal outcome’, this is likely to remain a losing strategy without ‘drastically changing course’ and investing more energy in movement building. This is not to say that all engagement should stop. Groups such as the Third World Network have tenaciously engaged in international climate negotiations with little more than the hope of damage limitation, yet have proven adept at advising understaffed developing country governments. 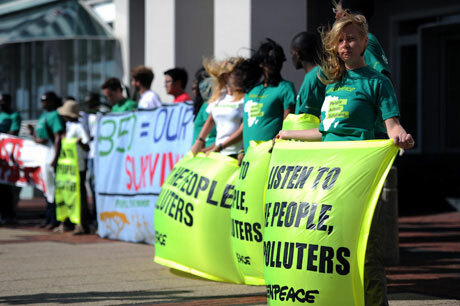 Alongside this inside pressure, climate justice groups protesting outside the ‘conference of polluters’ have sought to expose how it has not only failed the climate but has been used to promote damaging market-based ‘fixes’. 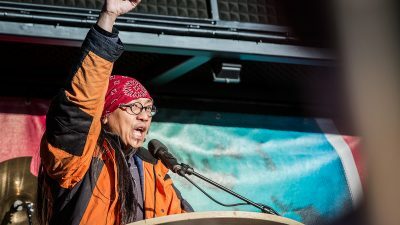 Yet protest pressure at climate talks is invariably trumped by those with other agendas – not only from fossil-fuel lobbyists, who are also downsizing their presence at climate summits, but also from governments with a tendency to treat climate talks as an adjunct to trade negotiations. Various options have been canvassed in the face of ever-diminishing returns. At an international level, Nnimmo Bassey has suggested ‘a People’s COP’ along the lines of a massive people’s summit in Cochabamba, Bolivia, in 2010. This has been seized upon by a growing chorus of climate activists, although there is a sense of deja vu in calls for an alternative conference in response to failed climate negotiations. The lessons from Cochabamba are instructive. Besides contacts made and information shared, that summit’s lasting legacy is questionable. The Bolivian government that called it has more recently been struggling with its own environmental contradictions, while the impetus for global co-ordination has shifted away from counter-summits to more decentralised encampments – from Cairo’s Tahrir Square to Madrid’s Puerta del Sol and the Occupy movement. These emerging movements have connected and learnt from each other without the need to be formalised in a single mega-event. Manifestos and declarations (a central part of the Cochabamba process) have been sidelined, although common actions have emerged in other ways. The 15 October call to protest was the most widespread international mobilisation since the anti-war protests, while several ‘memes’ (copycat slogans and symbols circulated online) have helped to forge a common movement identity. This was also present in Durban, where Occupy protesters mic-checked as they sought to adapt the language of the ‘99 per cent’ to the climate debate. Deepening the links between climate-related struggles and the Occupy movements remains a work in progress. Now more than ever, climate activism needs to reach beyond the desire to create a ‘climate movement’ and to be armed with more than just peer-reviewed science. At its best, the Climate Camp showed that connecting with local concerns rather than dismissing them as nimbyish could yield rewards, contributing to the failure of the third runway at Heathrow. Connecting climate concerns with the impacts of austerity is similarly important. To this end, the emergence of Fuel Poverty Action (a spin-off from the now-defunct Climate Camp) is encouraging. It is gearing up to take on the big six energy companies in charge of how 99 per cent of UK energy is sourced, produced and priced. In the process, it could help to flip the government script on climate change measures as the enemy of poor consumers, and show how the cartel of privatised energy companies is contributing to the problem. Such measures will not change the world overnight, but by setting out clear stories about how the current energy system disadvantages ordinary people and the planet, they are taking small steps to popular pressure that could prove far more difficult for governments to ignore than the corridor chatter at international climate conferences.